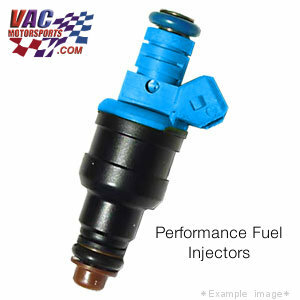 The same Injectors VAC uses on all our Street and Race Builds! Fuel + Air = Power... If you want to increase your engine output and are using things like bigger cams, intake, high performance headers, or forced induction then you will eventualy need higher flow rate injectors to make more power. Our fuel injectors offer outstanding idle quality, consistent flow, resistance to clogging, and the durability that only an world class OEM manufacturer provides. These quality's are essential for high performance racing applications, but also for street vehicles as well. Fuel + Air = Power... If you want to increase your engine output and are using things like bigger cams, intake, high performance headers, or forced induction then you will eventualy need higher flow rate injectors to make more power. Our fuel injectors offer outstanding idle quality, consistent flow, resistance to clogging, and the durability that only an world class OEM manufacturer provides. These quality's are essential for high performance racing applications, but also for street vehicles as well.